Do you hate losing money during your rehabs? Would you like to learn how to flip houses without getting taken advantage of by contractors? Tony Horner, one of the featured instructors at our most recent Landlord Convention, is going to teach you through a live, recorded "Fix & Flip" project: 5 extra-ordinary tips that anyone can do to stop losing money and time during your rehabs. Tony Horner got started in Real Estate in 1998. Back then he was busted and disgusted. He was sick of living paycheck to paycheck and busting my hump in 95 degree weather... on the weekends... when my family and friends were having fun at the BBQ. He knew there was a better way and he started studying Real Estate. Only problem was... He didn't have a bunch of cash to be throwing at houses, so he dug deep. He studied for almost 2 years until he finally stumbled across a gold mine of strategies that he is going to reveal to you. Real Estate enabled him to quit his job and retire after he did these specific techniques. Tony teaches you what really works... And Tony teaches some secrets that only a veteran investor who has closed 400 deals would know. This is not some re-hashed training that you see all over the internet, this is a real-life case study where he shows you EXACTLY how h made $28,800 on one of his MOST RECENT deals. You are going to see him controlling the rehab process from Day 1, so you can just duplicate what you see him do. And this is a typical deal for him. Tony is going to show you the specifics, the exact methods that he use in his business today which generate massive chunks of cash that allow him to live this way. These aren't just some random tips, these come from decades of experience and he not only teaches these things to you, Tony shows you each step of the way so that you are ready to go when you close on your next house. Normally Tony charges several hundred dollars for 1 on 1 coaching but because of technology, he is able to record himself going through a live fix & flip project. This means he doesn't have to meet with you in person or on the phone and you can still learn the same things. When you factor in his time, this video training is worth well over $500. If you click the link below he will send you access to "Rehabbin For Riches" for just $45. If Tony's mini training at our Convention, was any example of his ability to teach and the ideas he shares, you will receive in value MANY times the low price of this training. After you place your order, you will receive an email by the next business day with a link giving you instant access to this video series. 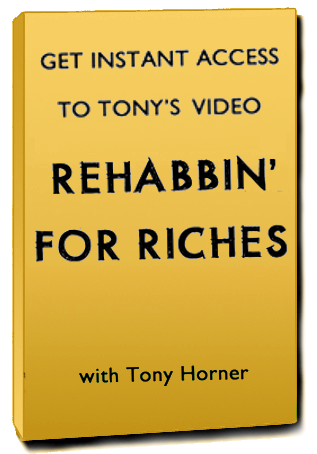 Grab "Rehabbin For Riches" Only $45 - LIMITED TIME!